The Arcturos Grüner Veltliner is the second release of this varietal from the winery, and shows the characteristics that make this Austrian variety such a classic on the world stage. 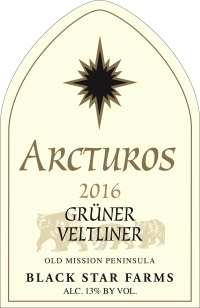 The Arcturos Grüner Veltliner has fruit qualities of ripe golden delicious apples, yellow plums, and an herbal quality that is similar to the grassiness you get in Sauvignon Blanc. There is also a white pepper spice that adds to its complexity and makes it that much more dynamic! Drink now or within the next 5 years. This wine is beautiful as an aperitif and will also pair well with a wide array of food preparations.